I’ve been looking for some good theatre to watch and so was excited when I found out that NTLive was airing in Hong Kong! Before this, I had actually never seen NTLive as I guess I’ve never really needed to go see it – working down the road from National Theatre for 6 years meant that I could always easily line up for day tickets if I hadn’t managed to sort out buying them in advance. And so I walked into PP’s cinema (at 10am in the morning!) telling myself that I shouldn’t compare it to live theatre, because really, you can’t. And you shouldn’t. You can’t, because the camera just can’t capture the live atmosphere and the tension in the air. The play is obviously designed for stage, and so even with clever film cutting techniques and angles, you can’t replicate the magical moments that films-for-films can create. And you shouldn’t, because if I’m watching NTLive, I should be accepting it for what it is – a filmed version of a live performance. I was soo grateful for the opportunity to see a production I’ve heard and read a lot about. Because it is filmed, you actually get a lot more close-ups and so you catch really detailed facial expressions. They also put extra effort into topping-and-tailing the experience with intros, behind-the-scenes interviews and rehearsal clips, which gives added insight into the play and makes the experience more whole. The main downside is that you are watching what the film director/editor has decided on – who you should be looking at, at which point and from which angle. But in a way, that’s actually quite cool because you are given a curated view. Insight into how the director envisioned it perhaps (I imagine they would have a lot of say as to how the film is cut). There were definitely sections though where I really wanted the camera to pan out so I could get a wider perspective of what was happening on stage. These technicalities aside… the play was fantastic. Shakespeare isn’t normally my cup of tea (I’m usually still frantically scrolling through the SparkNotes on my phone as the lights dim because I find the language hard to concentrate on and follow all the way through), but this play shows that Shakespeare has been really successful at creating timeless plays – the issues that he touches on are ones that speak greatly to modern day audiences. The cast was great, in fact phenomenal, especially Tom Hiddlesford. Such a compelling actor… the intensity of his expressions and eyes – the way they really speak… Some of his expressions will remain imprinted on my memory. The scene in which water descends from above and he washes his wounds – intense! And I wonder if that is actually aided by the camera close-ups. It was also interesting seeing Deborah Findlay perform in a role that actually was reminiscent of the mother role she played at Young Vic’s The Glass Menagerie. The set design and the lighting was fantastic too. Using really creative set design which incorporated quite a large digital element, they managed to transform Donmar’s really intimate space into an ever-changing set that went from the war zones of ancient Rome to the inner chambers and into the outside walls of the city. While the physical set and props were minimal (chairs, ladder, chains), the added effects of digital imagery and fireballs really were something. So all in all – highly recommend NTLive! Love the National Theatre – they are so innovative and this whole series that they are doing (which isn’t limited to just their own works i.e. 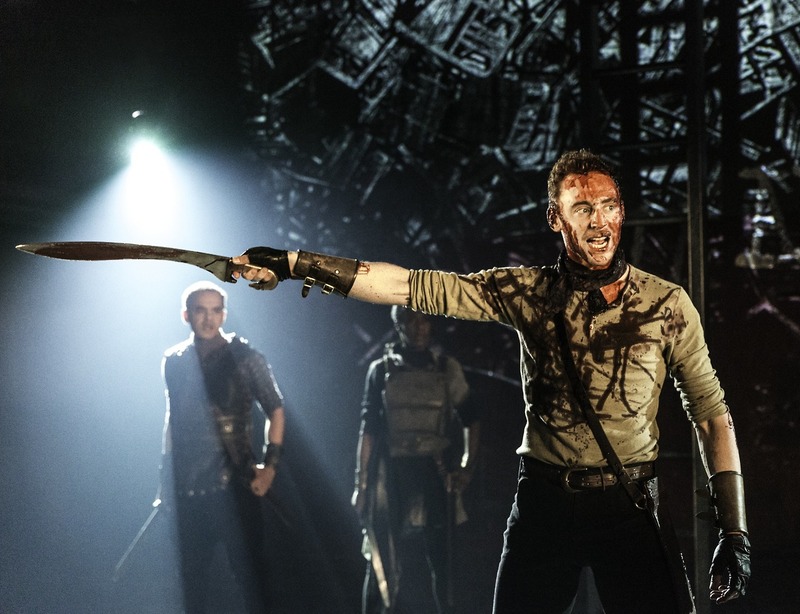 Coriolanus was actually Donmar’s production) are showcasing the best of British theatre and bringing their brand to the rest of the world!